Hey everybody, it's Truffles! Today I'm chatting with a really fun pup...Muffins, the canine star of Laura Pauling's Footprints in the Frosting. Following the interview is our review and a chance to win a $15 Amazon gift card. 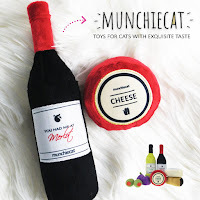 I would suggest using it to buy your kitty something special...but you'll probably use it to buy more books. 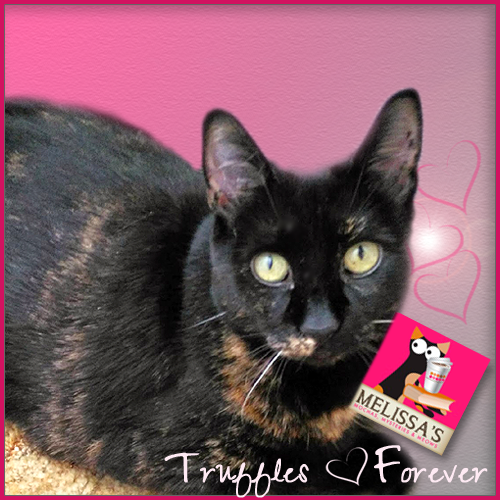 Truffles: Welcome, Muffins! Thank you so much for taking a few minutes to chat with me today. Could you start by telling us a little about yourself and how you came to live with Holly? Muffins: Ruff Ruff!! Hi Truffles! I was a little iffy when I was sent to live with Holly. She didn’t realize it but her parents hired me as a trained watchdog. Oh, not the type that can save your life--but you maybe some day. I’m highly aware of my surroundings. I watch out for Holly, alert her to any trouble, sniff out clues and bad guys. That sort of thing. You’ll learn more why they gave me to Holly in Murder with a Slice of Cheesecake. Isn't it fun being named after a dessert? But I have to ask...Holly specializes in cheesecake, so how did you get named Muffins? Muffins? Fun? Not really. Geez. I wanted a strong watchdog kind of name, like Tower of Triple Fudge or Bad *ss Brownie. Though, I’ve grown used to it, because when you’re named after a dessert, the bad guys tend to underestimate you. Well, that and my size. I’m like a secret weapon. I don’t know why Muffins. Maybe because it’s easier to say than Strawberry cheesecake? Could you imagine--me trotting off down the street only to hear, “Come here, Strawberry Cheesecake. Sit, Strawberry Cheesecake. Yeah, so not cool. You know, the typical my-owner-is-an-amateur sleuth type of day. 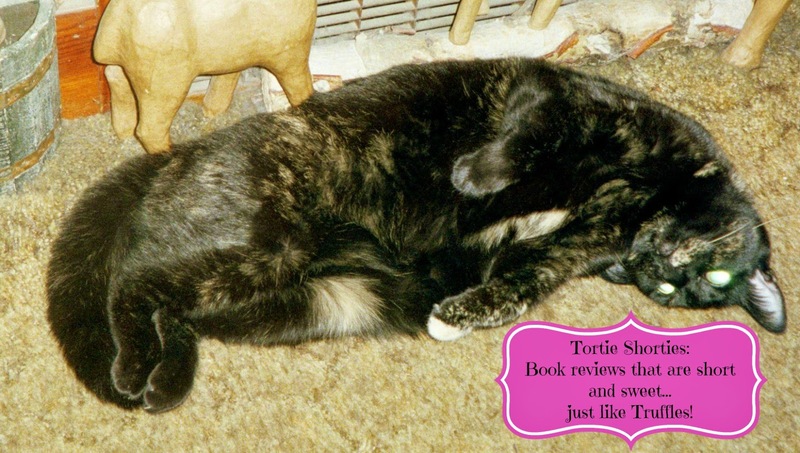 Eat, snooze, chase down clues, and create mischief and mayhem so Holly can do her thing. It’s really dog heaven, because most of the time, I’m with her. Not stuck in a house all day like some dogs. What kinds of mischief do you and Holly get into in Footprints in the Frosting? I like to call myself the Sherlock Holmes of the doggie world. Intelligent, but furry. I’m the star of high-action chase scenes. Holly might call it disobedience and threaten obedience school, but don’t let her fool you. It was all about me hot on the trail of the bad guys. Pfft. Disobedience. Just between you and me...are there any paw prints in the frosting too? Of course. I am a dog, after all. I not only sniff out crime, but delectable desserts. Humph. I’m still in kind of a doggie huff. After being the main canine attraction in Footprints in the Frosting and Deadly Independence, I now have to share the limelight with a Great Dane. He’ll be introduced in Frosted on the Ferris Wheel. From the publisher: Cheesecake, Love, and Murder! It’s the Grand Opening for Holly Hart’s new business, Just Cheesecake. When footprints in the frosting lead to a body facedown in one of her cheesecakes, Holly becomes a prime suspect. With her opening day delayed, Holly deals with a nosy no-good reporter and the local cop, the handsome Officer Trinket, as she puts her sleuthing skills to the test to save her business and her name. With the help of her dog, Muffins, she needs to find the real murderer, before the killer looks to frost someone else. 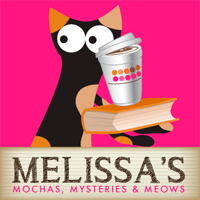 What a fun debut to the Holly Hart Cozy mystery series. Holly wakes up on the morning of her bakery Just Cheesecake's grand opening filled with nothing but excitement until she realizes her precocious pup Muffins is missing. She finds him in her shop's kitchen with a dead man who is face down in one of her cheesecakes. Who is the mystery man and what was he doing in her bakery??? Her grand opening and new life might be permanently put on hold if she doesn't track down the killer. 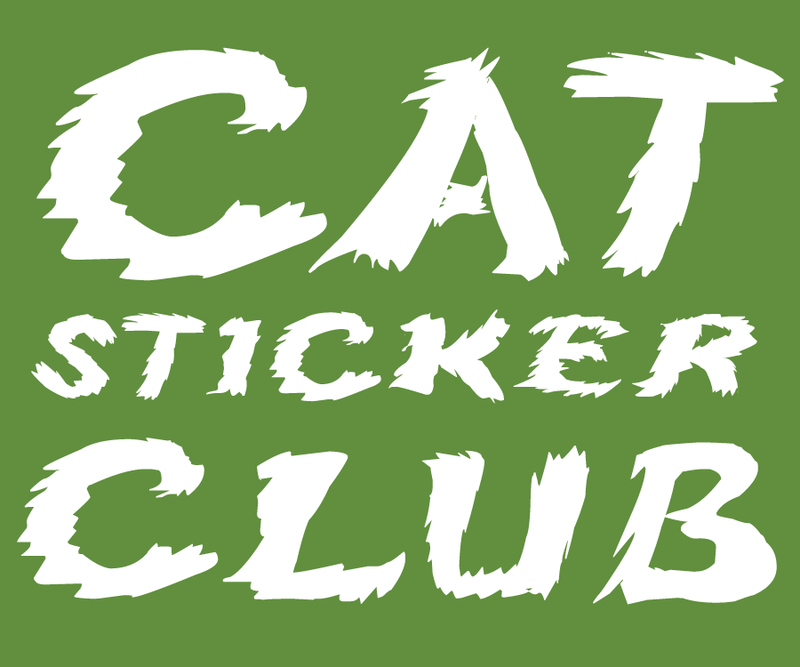 This is a very short book but it introduces us to some fun characters, from Officer Trinket to trouble-making reporter Millicent to cat lady Charlene (my favorite) and members of the local mystery book club. The identity of the killer really took me by surprise, and with everything wrapped up I'm looking forward to watching Holly's new business thrive. I'm also hoping to learn more about what Holly seems to be running from and why she's so distrustful of the police. 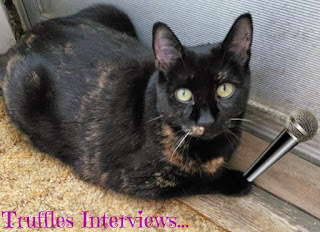 Awesome interview with Muffins, Truffles! The book sounds like a great mystery. Thank you for the giveaway. Truffles, you're a great interviewer. Thanks for the opportunity to get in on the ground floor of this series. Sounds like one I'll want to follow. 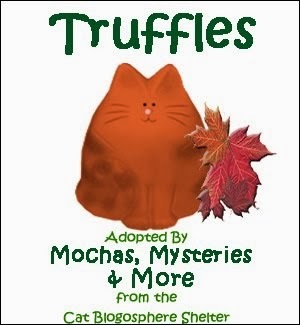 Truffles wow you should do it all the time you did a wonderful job. 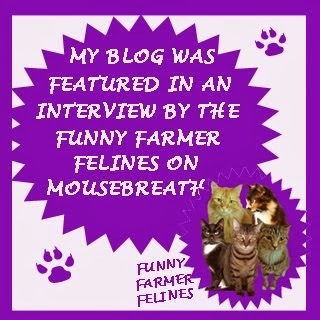 Pawsome Truffles, your interviews get better and better. Gweat weview and innewview Truffles. Have a gweat day. Yum, frosting tastes good. Need to read. Excellent interview Truffles. (You're right I would use it to buy books if I win. would love to read this, please!! !